Pleasing our customers by providing the best custom landscapes in the county. Our reputation precedes us because of our honesty, integrity, and passion on each project. We encourage you to ask around the community about who we are as a company. 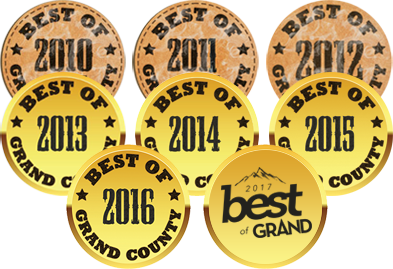 Grand County Landscaping was rewarded Best of Grand County in the Sky-Hi Daily News. Thank you to everyone for supporting us through the years. Dan Krupp has a Bachelors of Science in Horticulture from The Ohio State University. Grady Boomer has completed the courses through Colorado State University to become a Master Gardener. We have gone through ICPI classes and testing to become nationally certified paver installers. We have gone through NCMA classes and testing to become nationally certified segmental retaining wall installers. Every winter we continue our education through attending trade shows such as Pro-Green, where we take classes to keep up to date with the latest products. Grady Boomer was born and raised in Minneapolis, Minnesota and began working in the landscape industry in 1994 at the age of 19. He moved to Laramie, Wyoming in 1996 where he gained knowledge and experience while working for the prominent landscape company in Laramie. In 2001, he moved to Grand County and started Grand County Landscaping in 2003. Grady has now happily settled in Granby with his wife and two children. In his free time, Grady enjoys spending time with his family enjoying everything Grand County as to offer, such as camping, fishing, hiking, biking, climbing and skiing. Dan was born and raised in Norwalk, Ohio. His interest in landscaping began with his parent's home at the age of 14 and he worked for a landscape maintenance company throughout high school. Dan went on to The Ohio State University where he studied landscape horticulture in which he received his bachelor's degree. He interned with a high-end residential landscape company and then went on to work for the third largest landscape company in the country. In 2009 Dan moved to Winter Park with his wife and they now reside in Fraser. Dan joined Grand County Landscaping in 2011. 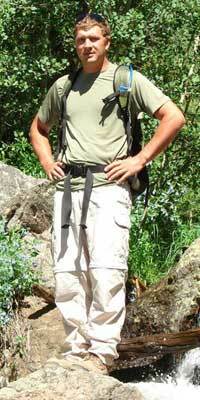 In his free time Dan enjoys the outdoors. 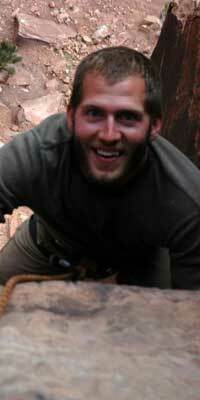 He is an avid mountain biker, rock climber, and skier. Dan and his wife spend their time traveling and seeing all that the west has to offer. 1Grand County Landscaping owned by Grady Boomer is a fantastic company. We have used Grady's company for a number of years and have always been more than satisfied with their work. They are reliable, well versed in all types of landscaping and very fair. We would recommend them to everyone who needs this kind of work done. 2Grady is a person of integrity and his company's services are creative, dependable and outstanding! I've used Grand County Landscaping for projects large and small and have always had a pleasant experience. Finely a contractor you can trust! 3Grand County Landscaping did an awesome job around our mountain timber home. Grady is truly an artist. He has the eye to transform a space and the team to get it done. He does an excellent job of mixing garden perennials with native wildflowers. 4We have found Grand County Landscaping to be a valuable source of suggestions and we value their opinion. They perform reliable work at reasonable prices. We have worked with them for five of the six years we have had a home in Granby. 5I've had the pleasure of working with Grady Boomer and Grand County Landscaping for the last five years. Working with a true professional in Grand County is a great experience. Grady's follow through is impeccable. Tasks, bids and projects are always completed when agreed upon. It's a privilege to recommend Grand County Landscaping. 6Shoreline Landing II used Grand County Landscaping as their subcontractor for the landscaping work, after these units burned down in 2009. Grand County Landscaping was the hardest working, most efficient subcontractor we had on our rebuilding project. We would highly recommend Grady with Grand County Landscaping for anybody that has a landscaping project. 7Thanks to Grand County Landscaping for renewing and redesigning my yard and gardens, with a handsome design of trees, bushes and flowers. The lupine are blooming as are the columbine, the Icelandic poppies and more. Even passersby stop to take pictures. What a show! I enjoy all the colorful views, as well as the stone river and flagstone walkways. If something needs attention, Grand County Landscaping is very responsive and helpful with everything from the irrigation, to the plants, to the hardscape. Thank you!